Last Gasp: Give a random friendly creature +3/+3. Haunting Spirit is a rare Endurance creature card. It is part of the Core Set. In addition to the card's availability in the Core Set, one copy is included in the Redoran Onslaught theme deck. 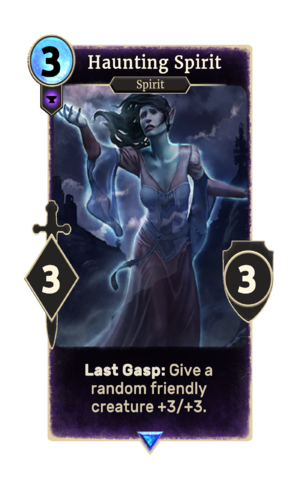 One copy is also obtainable in the Black Marsh Smugglers deck as a potential reward from The Restless Dead. "My time in this world... is done." This card's last gasp ability applies the Spirit's Gift card effect. This card is a possible reward for completing The Restless Dead, if you choose to read the ancient grimoire. This page was last modified on 15 February 2019, at 18:49.